The Atwoods, a family of 4 went out around 10:30 on Monday July 10th 2017 on what seemed to be an average day of swimming and picnicking at the gorgeous Shasta Lake beach specifically Centimudi, but what they caught on camera was anything but average. As they swam and played in the water they noticed multiple disturbances in the water at random locations and occasionally witnessed schools of fish jumping out of the water. I interviewed the mother Nancy Atwood at the Giant Orange restaurant in Shasta Lake City. She said was the first to notice all the fish jumping about and even saw a large black mass nearly breach the water surface. She illustrated her story with animated hand movements as though her right hand was a large serpent and her left hand was the water surface. The creature sighting was just one day earlier, and I could see her hands trembling and shaking as she tried to describe what it was she saw in the water. She called out to her husband Mark Atwood to look. She told me it seemed as though every time she told him to look, the mysterious black mass and startled fish would vanish the second he looked. She said finally after a few moments the creature breached the water and its head was completely in view. Said Nancy as she stirred with a spoon the creamer in her mediocre lukewarm cup of coffee. She went on to say Mark scrambled for his cell phone and fumbled hastily to switch it on to camera mode. 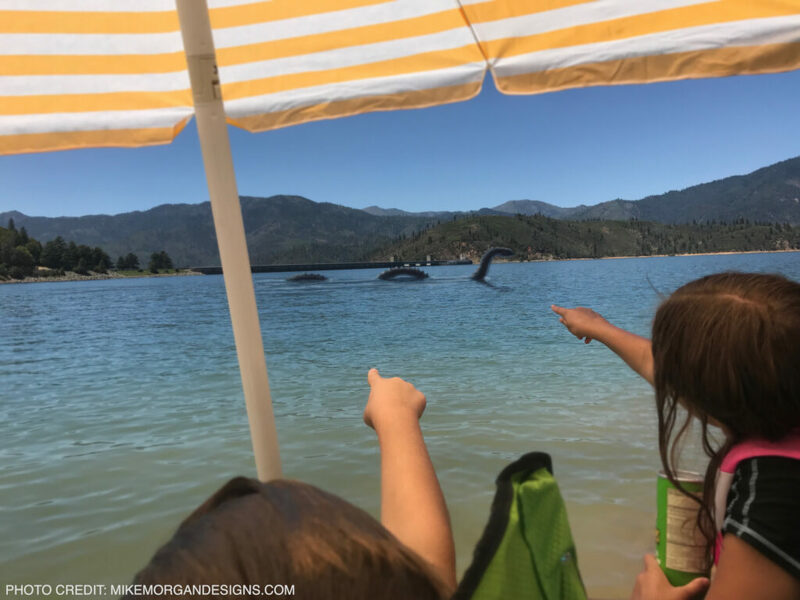 Nancy described the Shasta lake monster to be a glossy dark gunmetal grey blue color with smooth skin, and on the dorsal side it had what looked to have hard shell like spiked scales about every 18″ or so. She said the shape of its head was similar to a rattlesnake; angular and bulky, and its eyes were pure black. She described the creature as acting stealthy with slow and gentle movements. I found this story and sighting to be quite interesting, so I looked into it further. Can a giant serpent actually grow to this scale and live in this environment? Yes, in fact the Shasta Lake sturgeon can grow to be 8′ or more, so the food source is available to a creature of this size. With over 4.5 million acre feet of water, the creature would definitely have the room to roam. How can it be rarely scene by very few people, when the lake is constantly used by locals and vacationers all summer long? The color of this creature is described to be very dark, which even when it is a foot or more submerged it becomes highly camouflaged and invisible to unsuspecting lake users. The sighting of this creature is so rare and brisk no one ever gets a good photo it until now. Now everyone has a camera at the ready, so more photos of the bizarre wildlife are surfacing more frequently. How can a man made lake have a creature of this size and age? The answer to this question is a long story but here is a brief version. Shasta Lake was just the Sacramento River before it was dammed up, Shasta Dam at 602 foot high, and currently the eighth-tallest dam in the United States. It started out as Kennett Dam, Kennett California was the name of the town that had to be flooded to make the dam in the 1930s. According to Wikipedia the Shasta Dam served an important role in World War II providing electricity to California factories, and still plays a vital part in the management of state water resources today. When completed, the dam was the second-tallest in the United States after Hoover, and was considered one of the greatest engineering feats of all time. However, the controversial dam has massively changed the landscape, environment and ecology of the Sacramento River, and flooded sacred Native American tribal lands. The local elders of Shasta Lake tell the story of a native tribe who had their land destroyed by the Shasta dam project. The tribe was very angry they would lose their sacred land, and out of desperation and self perseverance they summoned an ancient native American horned serpent beast during a spiritual fire dance. The beast materialized in the Sacramento river at the base of the dam construction site. The beast is described as a huge, scaly, dragon-like serpent with horns and long teeth. The idea of the natives was to bring the beast to life and scare away the construction team and hopefully halt project. Despite the efforts of the natives the project went forward and the serpent lives on in the lake. I end this report with the theory that what Mark Atwood caught on camera is an 80 year old freshwater horned lake serpent spawned from the territorial usage and ownership of the northern California land and waterways. Shasta Lake is the prime hot spot for summertime fishing, swimming, boating and jet skiing located in Northern California just minutes from the city of Redding. The colossal lake is vast with it many pits arms and fingers, with a water volume of 4,552,000 acre·ft and a depth 517 ft. It is no wonder giant monsters can grow to the size they do with a habitat of this scale. Although the photo and story of this serpent are completely made up by Redding California Sci-fi artist Mike Morgan of Morgan Designs. The lake and its beaches are very real; Shasta Lake is a beautiful and epic place to visit for fishing, swimming, boating, jet skiing camping and more. If you read this you now are aware of this inspirational massive iconic place called Shasta Lake and we hope you come to visit Redding California and enjoy its many family friendly destinations. The photo was originally taken by Mike Morgan and the digital paint over art was created using digital painting techniques in Adobe Photoshop with the use of a Wacom Cintiq and the Morgan Designs Artist Glove a digital artist drawing glove for cg arts.